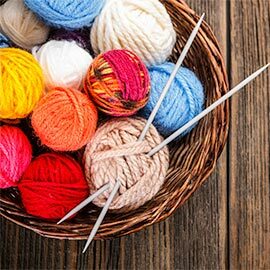 Laurier will host its first-ever knit-in on June 2 from 11 a.m. to 2 p.m. at Lucinda House, located on Laurier’s Waterloo campus. The event, which is part of the City of Waterloo’s Urban Knitting Project, is open to staff, faculty, students and community members. Staff and faculty are invited to bring their lunch and drop in over their lunch hour to knit or crotched a 30cm x 30cm (12" x 12") square. Knitting lessons will be given to those who want to learn. Some knitting supplies will be available if needed, but participants are asked to bring their own if possible. Light refreshments will be served. Knitted and crocheted squares will be assembled and installed in several locations in Waterloo’s uptown core. The knitting installation will take place from June 16-20, 2015. Those who would like to participate, but cannot attend the event, can drop off their squares or send via inter-office mail to Sondra Schwartz, acting director, University Relations at 202 Regina, Room 101. The Urban Knitting Project is part of the Project Brightspots series being hosted by the City of Waterloo. This series aims to inspire citizens by animating designated areas across the uptown. These efforts provide a sense of place, emphasize wayfinding and demonstrate community expression and creativity. The project will begin at the end of May and conclude during Culture Days in September.